Moroccan workers from both the private and public sectors on Monday staged demonstrations in Rabat to demand better pay and improved living conditions. Zouhair Asqiriba, deputy head of Morocco’s Technicians’ Union, told Anadolu Agency that technicians from various government ministries and institutions had worn yellow vests while taking part in the protests. According to Asqiriba, the demonstrations are set to continue for one week until next Tuesday. "Technicians resorted to staging protests after exhausting all efforts to sit down with government officials," he said, noting that technicians had not been included in ongoing talks between government and union representatives. In the event their demands are not met, technicians plan to organize a nationwide strike on Dec. 19 and 20, Asqiriba said. A new group of French protesters including retirees and high school students are following the Yellow Vests’ lead in demanding wage increases at the urging of some trade unions.Four trade unions -- the CGT, FSU, Solidaires, and FO -- called for nationwide protests for better wages, more public services, and more social protection.In the capital Paris on Friday some protesters gathered at the Republic Square and walked to Nation Square chanting against French President Emmanuel Macron and his government's policies.Nearly 15,000 French protesters, including high school students, took part in the protests across France.Philippe Martinez, secretary general of the left-wing CGT, told reporters that their protests had the same aim as the Yellow Vests and urged that they join forces.Speaking at a press conference after a European Council summit in Brussels on Friday, Macron called for "calm and order" ahead of another weekend of protests.“I don’t think our democracy can accept the occupation of the public domain and elements of violence,” Macron said.Macron said he had heard the protesters’ demands but added: “Our country needs calm. It needs order. It needs to function normally again. 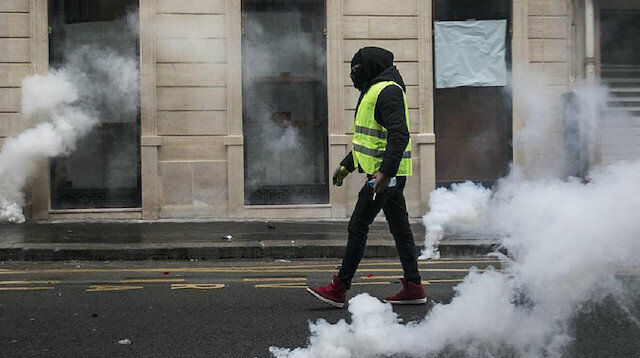 "Macron also dismissed calls for his resignation.Since Nov. 17, thousands of protesters wearing bright yellow vests -- dubbed the Yellow Vests -- have been gathering in major French cities, including Paris, to protest fuel tax hikes -- later cancelled -- and the deteriorating economic situation.The demonstrators, who generally live in rural areas due to high rents in the cities, have called on Macron to cut fuel taxes and ease their economic difficulties.According to a recent survey, 84 percent of the French people -- mostly from the middle-income group -- support the protests.Fuel prices in France have risen more than 20 percent this year.The Yellow Vest protests started in France but spilled over to other European countries including Belgium and the Netherlands.